Zebrafish, so named because of the zebra-like black and white stripes on the body of the fish is a small fresh water fish endemic to Indian rivers. These fish provide an excellent vertebrate model organism to study human diseases. Their genome is extremely well conserved with that of humans and most biological systems in humans can be modelled faithfully in this organism. Years of developmental genetic studies in the zebrafish has equipped the researcher with a well annotated genome, versatile genetic tools and a treasure trove of information on molecular pathways involved in development. The transparent and rapidly developing embryos allow for visualization of developmental processes and live imaging of cellular movement and changes in behaviour. Plus, growing in water these embryos and larvae are highly permeable to small molecules, endearing them to us especially as a model for chemical genetics. Liver is a vital organ essential for detoxifying our body, digesting food and maintaining homeostasis at various levels. It is such a vital organ that in many languages it is used to mean a very dear friend, a lover etc (jigar, kaleja, karal…). Liver toxicity or hepatotoxicity is a major side effect of a number of important drugs in the market. True to its importance for the body it is one of the rare organs in the human body that can regenerate robustly. Even then, diet, drugs, alcohol and genetics leads to liver damage and cirrhosis and even cancer in the late stage. 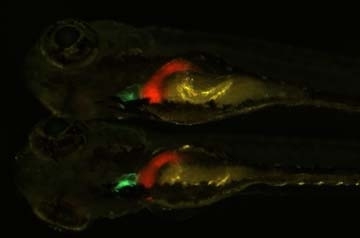 Liver visualized by red fluorescent protein in zebrafish larvae. Heart is in green. Abnormalities in the embryonic development lead to birth defects or congenital defects. Birth defects are not rare and can be caused due to genetics, nutritional deficiencies or drug abuse. We study a group of diseases known as neurocristopathies; these are birth defects that occur due to abnormalities in the development of neural crest. The neural crest is a multipotent and transient cell population in the embryo that migrates long distances to give rise to diverse tissue types such as melanocytes, cartilage and the peripheral nervous system. We focus on epigenetic regulators of neural crest development that have proven roles in birth defects.